I hit up the flea market with my pals Brian and Austin to yield an amazing haul of goodies! Above you'll see I found a retro brown travel bag for $2 bucks I intended to sell it but after using it I think I like it too much (it accommodates my camera and art supplies so well)! 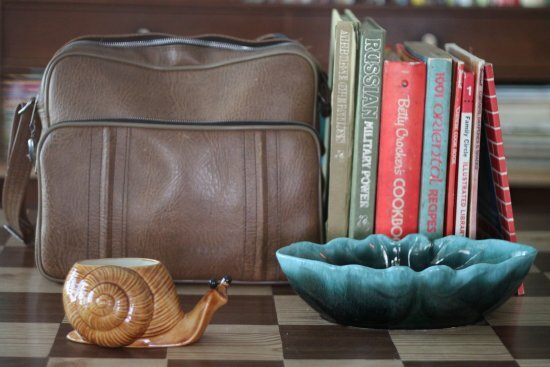 The vintage books were gathered at the flea market and the snail and McCoy pottery planters are from a new thrift store I found. I bargained with the dealer to get this pair down from $25 to $10. I hate the frames but I thought they'd be worth the risk, I love the energy in the figure's poses. And then I found this painting on velvet! As a huge fan of horror movies, how could I not love this scary piece of work! Horrifying! I adore the random bat on this beauty! The girl is kind of creepy too, but she suits the bright animated Thrift Core aesthetic, so I scooped her up for $2. The suitcase was 25 cents! 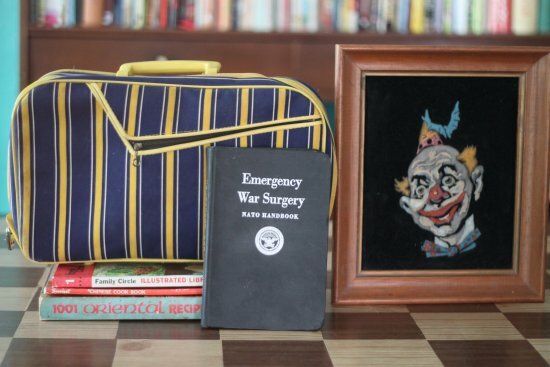 I found some amazing books this time, vintage military books and this military issue Emergency War Surgery Book! It's gruesome. And behold, a dream find! 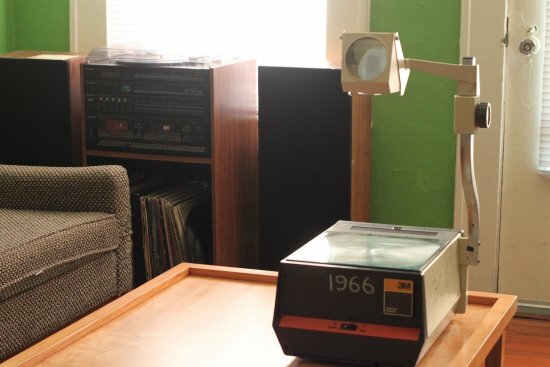 I've always wanted a vintage projector but they're always expensive. I got this one down to $7.00. I can't wait to use it for art projects and in the Thrift Core cafe for our art classes and fun art events. i LOVE the velvet and little suitcase! Great finds! LOVE love LOVE the little yellow suitcase! Will that be going in your booth? I love the projector!! That bag <3 oh my I would have kept it too. I love the stripe suitcase too. Now that clown is too scarey for me. I will stay away from it. 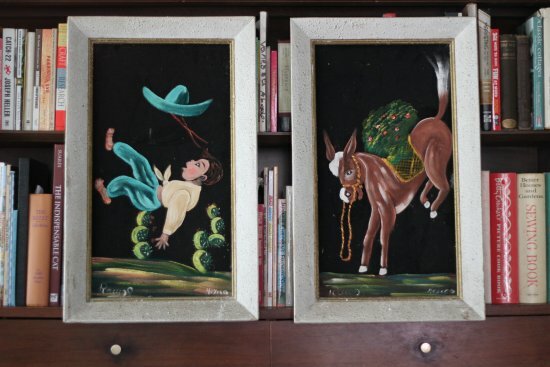 I'm partial to that set of Mexican paintings. what fun finds. Marcia: The suitcase was a lucky find on the way out ;) I love it too. Anonymous: Yes it is, it'll be there today! Susie: The clown is truly horrific. 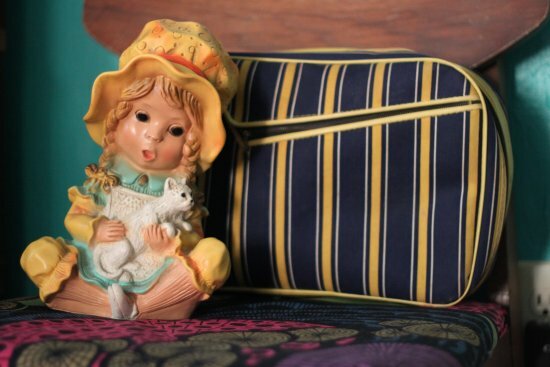 The Joyful Thrifter: I was lucky :) Nice find at the flea market. Victoria: Thank you, I hope the people at the shop are partial to them too! that surgery book... oh my. can you imagine being the one in need of surgery with the person holding that book? "let's see...it says here to make a 3" incision... oh wait, give the guy a shot of whiskey first... darn, drank that already..."
Careful, Van. That clown will kill you in your sleep. Ohhh so many nice...and spooky finds. 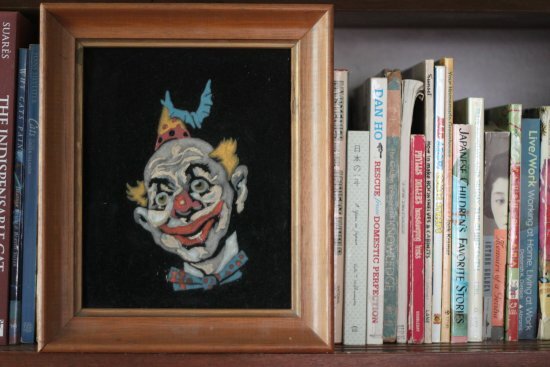 That clown (with pet bat...?) 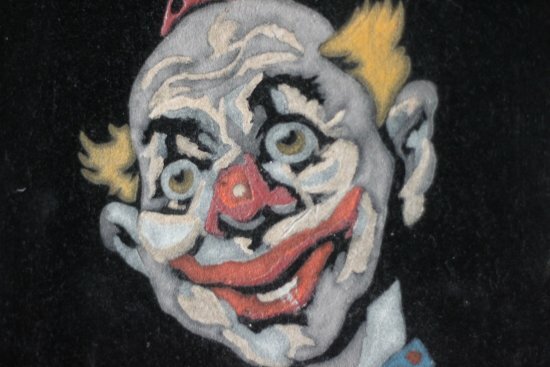 is haunting, and just proves my theory that all clowns are murdering bastards. But I do love that snail! Angelika: All my thoughts exactly as I flip through that gruesome book! The Southern gentlemen with the glittery pink nail polish that sold it to me was quite a character, too. Brian: I've been scaring my house guests with it already. The clown has become a running gag. "Don't go to the bathroom alone, 'Clown' will get you!" Jackie: I love the snail too, he's going to look gorgeous filled with some kind of vegetation. The bat with the clown is so strange- what sick mind painted that thing!? That is one creepy clown! Man, I haven't seen a projector like that since middle school! I LOVE your brown travel bag. I've been wanting one for ages! lost property vintage: It definitely is! He's just perfect. I think I'll keep him. Sarah: We had 'em all the way to high school, we didn't upgrade equipment in our school system! I'm a sucker for school props so I'm glad I found a practical one. And I've been wanting a brown travel bag/casual tote for a while, I guess I've no choice but to keep this find. Faith: I love him, he's too cute! Looks like you had a great shopping experience! 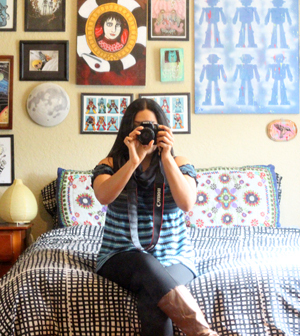 Love the pair of Mexican-inspired pictures and the McCoy pottery. I love love love that snail! I've been looking for one just like it forever. All your finds are fantastic as always. I'm super jealous that you picked up such a great projector for a fab price! It's going to be great in your shop! JunkStuffTreasures: We had a blast, 'twas an excellent shopping experience! :) I think the Mexican-inspired pieces were actually painted in Mexico. Flo: The projector was the surprise find of the day, I thought I'd never find one and there it was in a nondescript corner at the flea market. Just shows you have to keep hunting all the time to encounter the "dream finds"! You have some really neat finds! And I'm enjoying your entire blog! I know this post is a few weeks old, but would you mind posting this at my blog hop? It's a post with just what I'm looking for-bargains! It was neat seeing your McCoy planters too-I started learning about pottery after I started selling on ebay, and what a fun world (pottery) to explore!